My garden is producing an abundance of squash lately so I’ve had to come up with a few creative ways to use it up. Why is it that there are so many recipes for baking with zucchini, but so few for summer squash?? It really is strange to me that zucchini in bread is such a normal thing, but you hardly ever hear of summer squash the same way?? Anyway, I found this delicious recipe on Pinterest and have adapted it to share with you today. 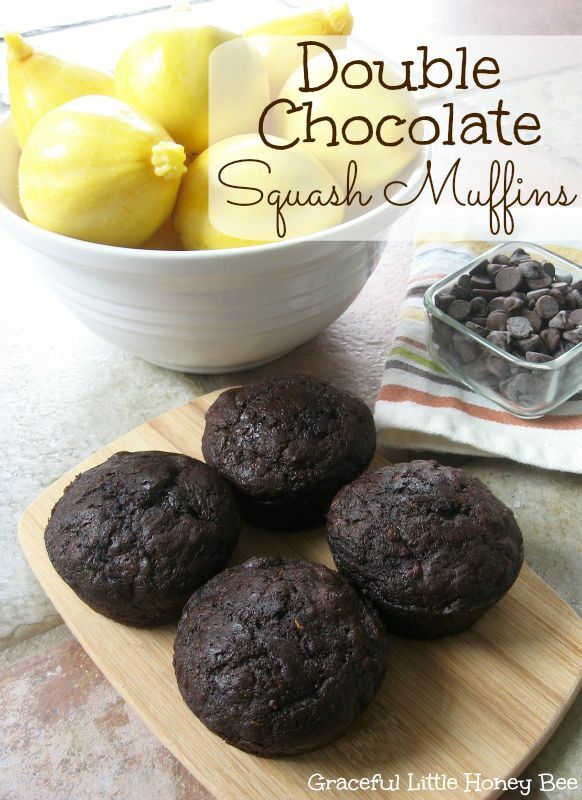 These Double Chocolate Squash Muffins are hands down the best way to eat a vegetable. They seriously taste like a brownie. YUM! I hope you enjoy. Step 1: Preheat oven to 350. Grease muffin tin. Step 2: Squeeze excess moisture from squash. Step 5: In separate bowl, combine flour, baking soda, baking powder, salt and cinnamon. Step 8: Pour into greased muffin tin. Step 9: Bake for 20 minutes. Preheat oven to 350. Grease muffin tin. Squeeze excess moisture from squash. Mix in eggs and squash. In separate bowl, combine flour, baking soda, baking powder, salt and cinnamon. These are AMAZING! Just took them out of the oven and ate one. They will make a regular appearance at our house. Thanks for the recipe! Can't wait to try these muffins. They look so beautiful and dark. You said to grease the tins, can I use paper muffin liners instead? You can substitute yellow squash for zucchini in any recipe. They are interchangeable. Does the squash need to be cooked before mixing it in? Best Muffins Ever! and I am critical when it comes to muffins-these were DEE LISH OUS!! These are one of the best muffins ever. Very moist and full of chocolate flavor. In the directions, can you add where to add the cocoa powder? It makes sense to add it to the flour and other dry ingredients, but it is not listed in the directions. Excellent recipe and will make again now that the squash are in the garden. Thanks. A 1/2 cup of cocoa powder isn’t going to produce muffins that dark. Did you do anything additional to the ones in your pic? No, I went by the recipe as it's posted. Great recipe! Kids loved it. Didn't have chocolate chips, so I left them out and they are still fantastic. Thanks! I made these a couple of months ago and then froze a couple of batches. Wow just took them out thawed and then kept in the fridge, they are even better we think. This recipe is outstanding!